Lawn sod is a commercial product, grown on farms by lawn professionals who know how to give grass seed or sprigs the best start possible. Sod develops on prepared soil ideal for the type of grass they are growing. It is designed to be weed-free and healthy through the proper use of lawn fertilizer. Harvesting lawn sod is accomplished by slicing into the soil about an inch or so and then cutting under the grass to release it from the earth. Then it is rolled carefully and shipped to your local nursery or garden center. Lawn sod has several appealing advantages. For instance, sod creates an instant lawn without waiting weeks for seed germination. Additionally, sod can be installed any time of year providing that your ground is not frozen. The main advantage of sod is it will provide you with a lush, dense, weeds-free lawn. Because of its density it will also discourage future weeds from taking root. While it may cost more than seed, installing lawn sod is the best way to obtain a beautiful lawn that will be the envy of the neighborhood. Sod is often used to replace an existing lawn that is thin, full of weeds or otherwise unattractive. Slopes and hills are also excellent opportunities to experience the advantages of sod. While seed will easily wash away from this type of surface, sod is an instant green carpet that will prevent further soil erosion while adding beauty to your landscape.Additionally, sod is often used where there is a newly constructed home to add instant curb appeal and to prevent mud from being tracked inside. If there are bare spots in your yard, you will find that sod is excellent for use in patching any holes in your current lawn as well. There are several considerations to keep in mind when you choose sod. First, be sure you have the best quality sod in order to make the most of your investment. 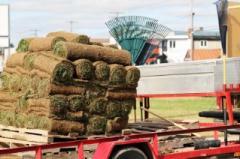 If you can, find sod harvested no more than eight hours previous to your actual purchase time. This way you are assured of healthy plants that are not over stressed. Secondly, ensure the sod is a variety that will grow well in the hardiness zone you live in. If you are patching an existing lawn you will want to match the type of sod to the grass that you already have. Lastly, always prepare your soil before you bring new sod home. The sooner you can get your sod in the ground the better start it will have. 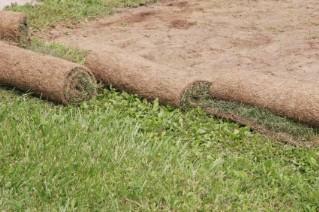 When shopping for sod, look for rolls with no more than an inch of moist soil on the bottom. The grass should be thick and healthy with at least two inches of growth. In addition, there should be no build up of thatch and the color should be uniformly green. Also, look for a nice strong root system to assure a healthy lawn. Proper installation will give your lawn sod the best start. First you will want to remove the existing lawn if you have one and be sure the soil is properly prepared. This will include removing any debris and adding a soil amendment if necessary. Next, you'll be ready to roll out your sod. Feel free to cut your sod with a sharp knife to fit oddly shaped areas. Stagger your rows so the edges don't all line up. Think of the pattern when you lay bricks for an idea of how the strips of sod should look. Use a lawn roller after the strips have been laid so the roots will all be in direct contact with the soil. Failure to do this may result in dead spots in your lawn. Water your new lawn sod and keep it moist to give it a fresh new beginning.